« Chocolate. Red Wine. A Divine Combination. 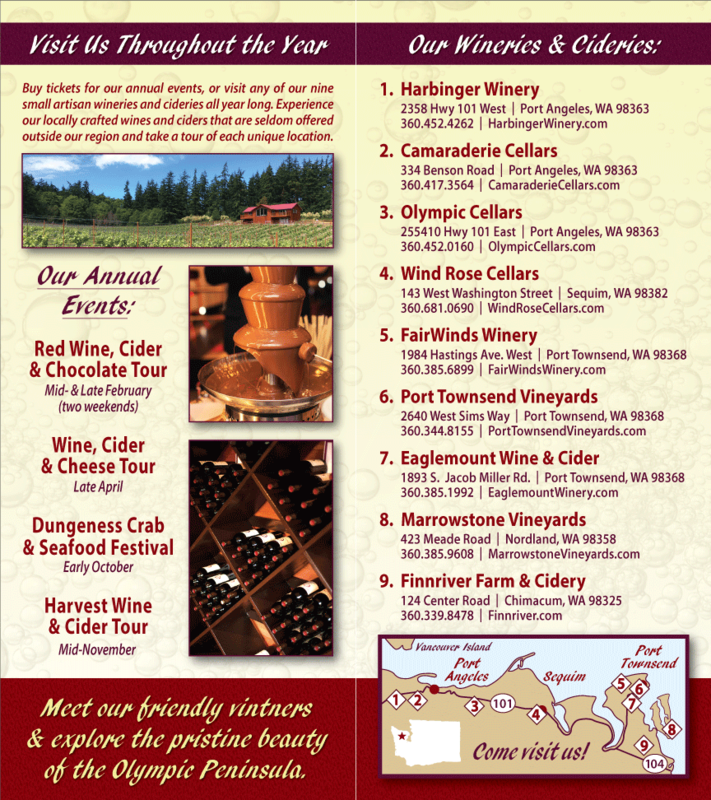 The Red Wine & Chocolate Tour at Olympic Peninsula Wineries begins this weekend, February 11 and 12, 2012. It continues the following weekend, February 18-20. This is one of the most anticipated events of the year. Sublime combinations of wine and chocolate are explored and celebrated. Each participating Washington State Winery and Cidery on the Olympic Peninsula will have something unique to share: a deep, dark chocolate fountain, sinful truffles, and an abundance of new release wines. Try a variety of sweet combinations at Black Diamond Winery. Chocolate truffles will be served alongside Raspberry, Loganberry, and Strawberry Wines. Black Diamond will also be pouring their Syrah, for folks who like life a little less sweet. Try cocoa spice-rubbed pulled pork at Camaraderie Cellars in Port Angeles. There are chocolate desserts, and then there is chocolate food. It’s hard to resist Camaraderie Cellars’ cocoa spice-rubbed pulled pork cooked in a wood-fired oven. Try it with the savory chocolate bruschetta, which is unlike anything we’ve ever tasted. Enjoy them both with the 2009 Syrah, which will be released during this event. For the sweet teeth out there, Camaraderie will serve Molly Baby chocolate shortbread cookies and Equal Exchange Fair Trade Chocolate bars. Cabernet and Merlot varietals will be served alongside these goodies. Tucked away on a lovely piece of ground above Discovery Bay, Eaglemount will serve new releases of their cider, mead, and red wine. Chocolates by Chocolate Serenade add a sweet touch. Dip a strawberry into the chocolate fountain at FairWinds Winery, in Port Townsend. It just wouldn’t be the Olympic Peninsula Red Wine and Chocolate Tour without a chocolate fountain. The fountain at FairWinds Winery is said to be the tallest chocolate fountain on the Peninsula. Dip fruits and sweets into this delicious pool of dark chocolate and try the latest vintages of Gewürztraminer, Port O’ Call, and a Carbernet Sauvignon / Merlot blend. You may not want to leave. Warm yourself with Finnriver Cidery’s newly released Raspberry Wine and then savor chocolate-covered berries. Try Black Currant and Pear Cider cocktails with outrageous chocolate brownies. Treat yourself to a ticket to the Chocolate Chamber, where you can dive into a cup of “BLISS” Chocolate Elixir, a creamy gourmet sipping chocolate by Jennifer Michele Chocolat of Port Townsend. Mount Olympus Black Truffles by Wicked Little Sweets are divine. When paired with Harbinger Winery’s newly released 2009 Bolero, they’re sinful. If you appreciate good beer, don’t leave without trying Bar Hop Brewing’s Venezuelan Chocolate Porter. Harbinger Winery is also hosting Aphrodisiac Chocolate tastings in the Kitty Kat Lounge. Reservations recommended. You may think you’re wine tasting on Washington State’s Olympic Peninsula, but when you step into Olympic Cellars, you’ll realize you’re actually in Paris. Sip red and white Washington State Wines, savor handcrafted chocolates by Yvonne Yakota, sway to French music and watch an artist at work. Don’t leave without trying a freshly baked chocolate croissant. Italian grape varieties grown in Washington State are the foundation of the wines at Wind Rose Cellars in Sequim. Try the newly released 2010 Dolcetto and sample the creative chocolate combinations made by Sequim’s Cocoa d’Amici: Hazel Nut Crunch, Pistachio Fig, and Ginger Cinnamon. Additional information is available at Red Wine & Chocolate Tour. Bon appétit!